Yes, I would like to receive Offers and Updates. We will only send updates periodically (not even every week) and we will not give your information to 3rd parties. Only 8 km from the charming and popular village of St. Rémy de Provence, and only about 1 km outside the village of Eyragues. 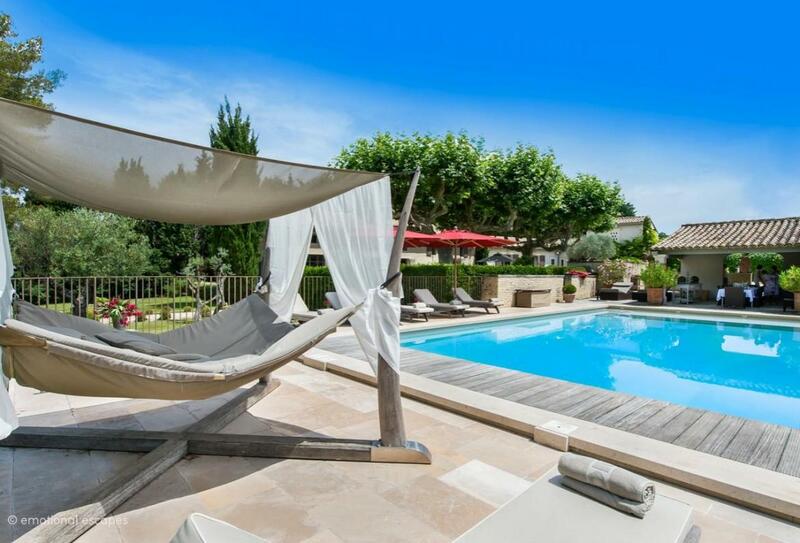 The Bastide de Lavande et des Pins is a superb Provencal luxury villa property located in the countryside. The villa sleeps 14 people in 9 rooms, 4 of which are en-suite with 2 additional separate bathrooms shared by four bedrooms. There is a main house, and a grange with 2 bedrooms and one bathroom. Private pool, tennis court, basketball and trampoline. Air conditioning throughout. The Bastide de Lavande et des Pins is a superb Provencal luxury villa property located in the countryside but only 8 km (5 miles) outside of the charming and popular village of St. Rémy de Provence, and only about 1 km outside the village of Eyragues. The villa sleeps 14 people in 9 rooms, 4 of which are en-suite with 2 additional separate bathrooms shared by four bedrooms. There is a main house, and a grange with 2 bedrooms and one bathroom; rooms and spaces are large so everyone can have a lot of privacy. There is a 13 x 7m pool, pool house/kitchen and large dining area. Plus you have a half court for tennis or baseball, a trampoline, and swing set. The Bastide is an ancient Provencal farmhouse which has been totally restored and improved upon, with air conditioning added throughout and the most incredible kitchen added. English speaking caretakers live on the property but away from guest housing; they are available to answer any questions and to help plan your holiday. You can also request that they prepare a daily continental breakfast for you, at an additional charge. Adults and children alike will enjoy the Bastide de Lavande et des Pins! St Remy de Provence is perhaps the most beautiful small town in Provence. Post World War II, it was an agricultural area, specializing in flower seeds and sheep, but now is known as a sophisticated country town with some of the best that Provence has to offer, and with a wonderful, central location. There are many sites in St Rémy: the very important Roman ruins at Glanum; the rue Hoche, a tiny street where French-Jewish doctor and astronomer Nostradamus was born in 1503. Don’t forget the colorful Wednesday market which is well known all over Provence. Vincent van Gogh spent most of the last year of his life here, at the St.Paul de Maussole Clinic, and painted over 150 paintings. Choosing to stay in the Alpilles places you in one of the South of France's most sought after regions. The Alpilles are one of Provence's most beautiful landmarks, with dramatic landscapes and a natural, unspoiled environment. The Alpilles are one of Provence's most beautiful landmarks, with landscapes, a natural environment, this area is a haven for the South of France refined traditions and produce. Whether staying in a renovated stone farmhouse or a luxury contemporary villa you will surely be touched by the region that is to this day home to world inspiring-artists. Les Alpilles takes its name from a chain of small mountains creating a 30 miles triangle to the South of Avignon. Artists and celebrities such as Van Gogh, Frederic Mistral, have made the villages of Saint-Rémy-de-Provence, Baux-de-Provence and Eygalières famous throughout the world. It is as though the natural sunlight, surrounding mountains, orchards, cypress covered hills and olive trees are there specifically to inspire and create emotions for the visitor. Arrival after 4pm, Departure by 10am. Times may be flexible out of high season. Cleaning: 20 Hours per week of cleaning. Parking spaces: 8 Parking spaces. Paypal protects you from checkout to delivery and use the latest anti-fraud technology.